Humankind has conducted this experiment before. Many times. We know it doesn’t work. And yet, because it hasn’t happened to us, here, in very recent history, we somehow think it will. Anytime you hear someone say ‘But this time is different’, take your physical silver and gold and run. Fiat currency dilution always, always, always ends in systemic collapse. Don’t be one of the majority who will be left wondering how they didn’t understand it was nothing more than ink on paper all along. This chart of "debt securities and loans"--i.e. 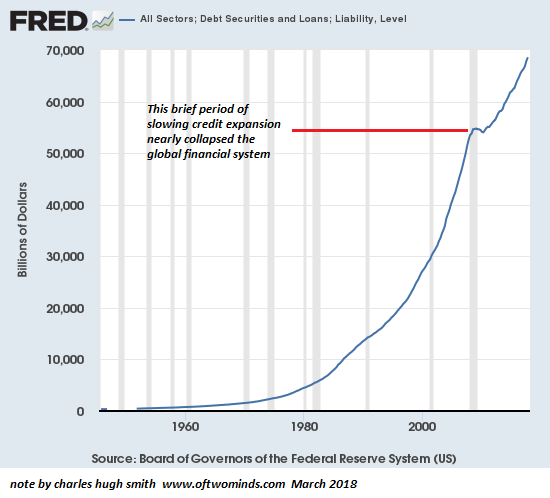 total debt in the U.S. economy--is also a chart of the creation and distribution of new money, as the issuance of new debt is the mechanism in our financial system for creating (or "emitting" in economic jargon) new currency. When a bank issues a new home mortgage, for example, the loan amount is new currency created out of the magical air of fractional reserve banking. Central banks also create new currency at will, and emitting newly created money is how they've bought $21 trillion in assets such as bonds, mortgages and stocks since 2009. Is there an easier way to push asset valuations higher than creating "money" out of thin air and using it to buy assets, regardless of the price? If there is an easier way, I haven't heard of it. Which brings us to the question: how much longer can we get away with this travesty of a mockery of a sham? How much longer can we get away with creating "money" by issuing new debt/liabilities to grease the consumption of more goods and services and the purchases of epic bubble-valuation assets?